If you have ever visited Gilford’s Rowe House you’ve probably noticed that it has four chimneys. Being an inquisitive person (I like that word rather than nosy), I asked with to view the chimneys from their fireplaces on the first floor to their bases in the cellar. This was quite interesting. First, they were completely made of bricks. Bricks made by Benjamin Rowe himself with clay taken from his own property. What I found so unique was that there are recessed arches in the bases of the chimneys, some with shelves. We had a fireplace in the home where I grew up, but I don’t recall any chimney in the basement - just a little door in the wall the ashes came out to be included with the trash. Wondering to myself, is this so they draft better? Is it just for design? Did he run out of bricks? Hmmm. Let me tell you what I’ve learned about the design of these central chimneys. Researching, I learned that centrally located fireplace chimneys were in existence as far back as the 1700s. In many central-chimney dwellings the chimney stack would have been built on an artificial foundation. Such foundations varied widely in size and construction. Some had chimney bases consisting of twin stone piers spanned by heavy split logs. The brick portion of the chimney was constructed atop the log platform, the first-floor hearths being well insulated from the underlying wood by layers of brick, clay, or rock salt. In many houses built after the turn of the nineteenth century, split stone, or large flat stone slabs were used instead of logs to support the chimney stack. In the 1800s brick vaults were a common type of chimney base. These imposing arched foundations are built on piers that rest on stone footings beneath the level of the cellar floor. Not prepared (and certainly not allowed!) to dig beneath the basement floor in the Rowe House, I’ll leave the question of the what footings are under these chimneys open! One good reason that seems obvious to me for having a central-chimney is the added warmth provided by the expanding bricks when heated. On an outside wall most of this warmth would be wasted. Ergo the recessed arches in the basement of the Rowe House chimneys. Such arches, i.e. vaults, were ingeniously contrived to serve the dual purpose of heating the house and creating an area where foodstuffs could be stored. Such chimney positioning also lent itself to more wall space for windows, especially in a small dwelling such as the Rowe House. Very clever, I thought. While researching I came across a book that explained the applications and use of a Rumford Fireplace. When comparing the description of this type of fireplace construction it appeared to me that the fireplaces at the Rowe House were constructed in like design. They are quite shallow in depth, the sides and back have a bit of an angle to them, and are made entirely of brick. Some back walls (at other locations) were made of iron. It is claimed, by Rumford, that a smoke shelf (brick of course) of specific size be placed horizontally on the inside chimney wall will all but eliminate smoking as this creates the almost perfect draft needed for this purpose. 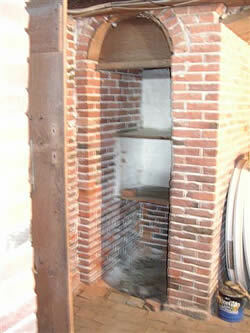 This smoke shelf was the forerunner of what is today called the damper. Only the fireplace in the kitchen of the Rowe House has been replaced with a stove - of what vintage I cannot say, but definitely not of modern times. It is believed, by some, that at one time this stove resided in the train station below Kimble Castle and was used to provide warmth for the workers while awaiting transportation from the Castle after their days work. It is a pleasure to browse through this wonderful 1838 home discovering something different “new” and/or unique from the last visit.